The Saddleback Butterfly, Chaetodon ephippium, is also commonly referred to as the Saddleback butterflyfish, Blackblotch Butterflyfish, Saddled Coralfish, and Saddle Butterflyfish. It's body is yellowish gray adorned with a large black area on its back, edged by a broad white band. There are several wavy blue lines on the sides and strong orange - red markings that accent the rear fins and the base of the tail. As an adult, they have a long pennant that streams from the dorsal fin. The Saddleback Butterfly can grow to be 11.5 inches, and requires a tank no less than 100 gallons if kept individually, and no less than 130 if kept in a pair. They can also be kept in groups, in a much larger system. 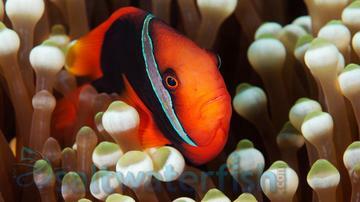 In keeping more than one, it is best to add them to the tank at the same time to avoid aggression. The Saddleback Butterfly loves to hide in various cracks, crevices and holes during night time, therefore the tank should be well established with plenty of live rock creating hiding spots. It is mainly active during the day time and lethargic at night time. Though not a very quick swimmer, it swims freely and usually spends a good deal of its time in the open water. They are one of the more peaceful species, and should be housed with other species of similar temperament. 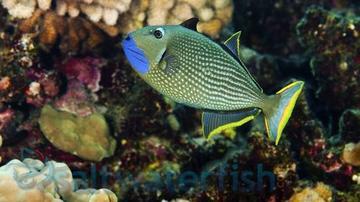 But cam become territorial towards other Butterflyfish. They are not considered reef safe, as It is often found nipping over the soft and hard Coral Polyps, Sponges, and Tunicates, but will also snack on a variety of Benthic Invertebrates including Polychaete Worms, Fan Worms, and other Invertebrates. 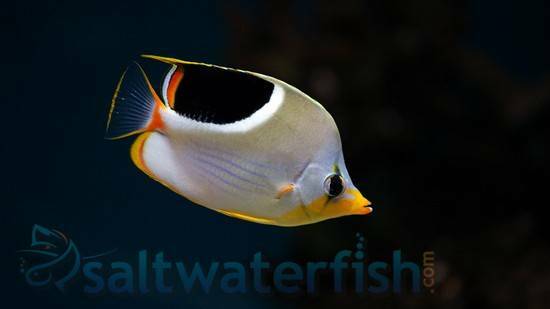 The Saddleback Butterflyfish is a durable fish and can live up to 15 years in a properly maintained saltwater aquarium. And once acclimated, the Butterflyfish is quite hardy. The Saddleback Butterfly should be fed an omnivorous diet, consisting of Brine and Mysis shrimp, finely chopped Clam, Shrimp, and Crab, as well as Spirulina and Japanese Nori. Commercially prepared foods containing Sponge and Algae can also be provided, along with filamentous Algae and Sessile Invertebrates in the tank. Initially the Saddleback Butterflyfish might be resistant to accepting a captive diet but will eventually learn to adjust to its new diet by following the example of its tank mates. They will thrive well in a temperature range of 72-80°F and a pH of 8.1-8.4.